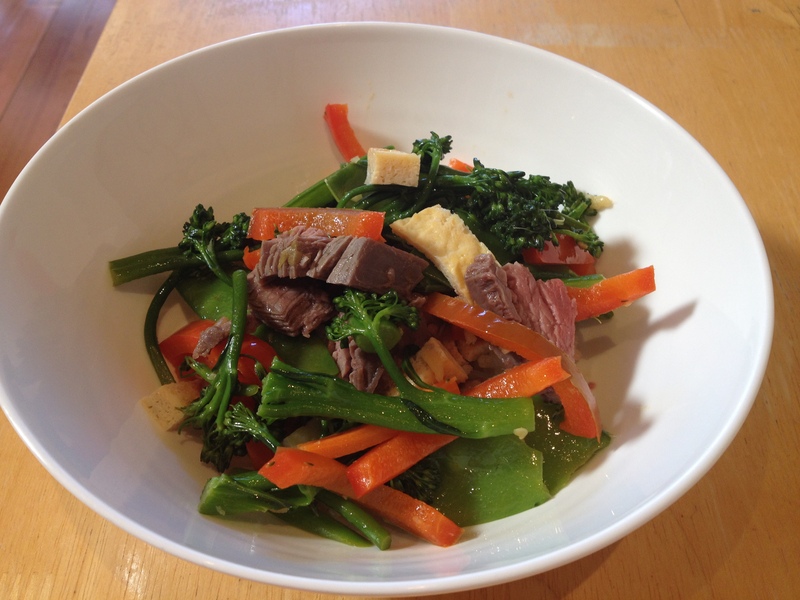 This stir-fry is very a impressive dish & believe it or not, it’s all cooked in the Thermomix – rice, steak, omelette & vegetables. The flavours are lovely & everything is cooked gently, so you’ll notice that the flavour, texture & colour of the vegetables in particular, are amazing. This dish is easy enough to be made as a mid week meal, or made on the weekend to entertain guests. This quantity easily feeds 4 adults & you can just increase the amount of steak, rice & vegetables to feed additional people. The steak is cooked in a whole piece, then rested & sliced. You’ll also notice the rice cooks with the steak marinade through it, which leaves it very fluffy & the flavours from the marinade infuse through the rice. This is also a fantastic dish to make if you’re wanting to cook more with your Varoma & there are so many elements to the recipe that you can cook separately for other meals – especially the omelette & vegetables. It will also give you more confidence cooking in layers with your Thermomix. 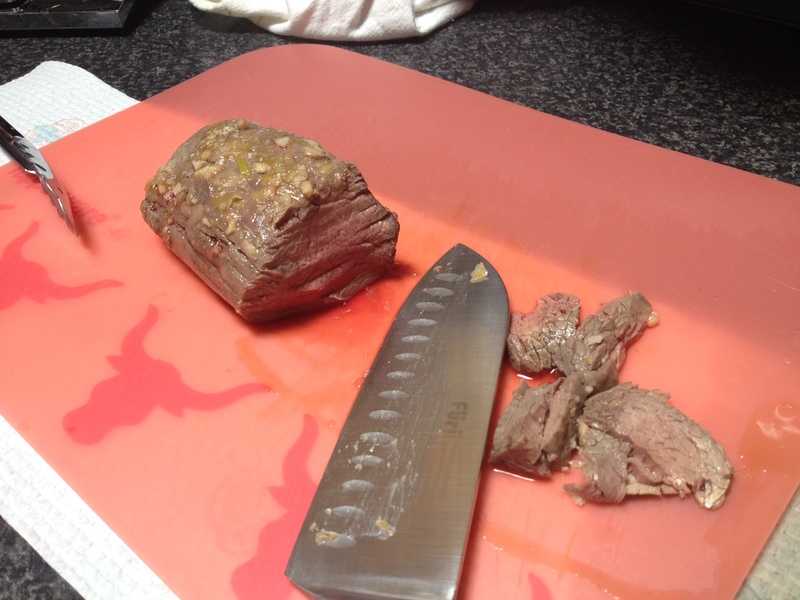 I actually used a 380g pice of eye fillet for this dish & I was sceptical that it would be cooked in 20 minutes, but as you can see from the photo’s throughout this post, it was perfectly cooked. If you hesitate to steam meat, I understand how you feel. All I can say, is give this dish a go – you definitely won’t be disappointed! This recipe is from Dani Valent’s cookbook ‘In the Mix – Great Thermomix Recipes’. If you’re not familiar with Dani Valent, she is a Melbourne based food writer, who is a very keen cook & wanted to extend her Thermomix repertoire. ‘In the Mix’ was released in August 2011 & ‘In the Mix 2’ followed 2 years later. Dani’s recipes are from world class Chef’s all over the world & she has tested them all in her Thermomix, all in her own kitchen at home. Her recipes are quite advanced, so not for beginners, but great for the creative cooks when they have time on their side. 1) First, make the steak marinade. Place garlic & spring onion in TM bowl, chop 2 seconds/speed 7. 2) Add oyster & soy sauces, sugar & sesame oil, mix 10 seconds/speed 3. 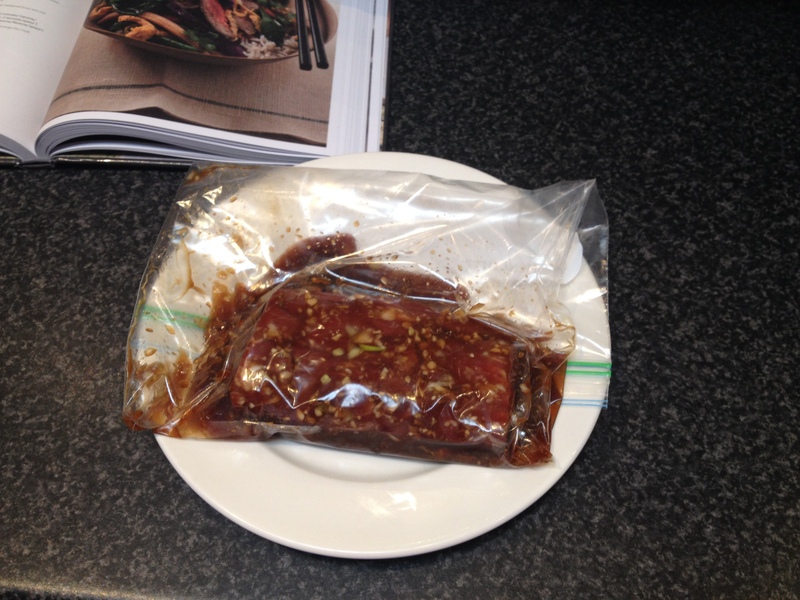 Pour or rub marinade over steak & leave it in the fridge, in a zip lock bag or bowl for at least 20 minutes. 3) Without cleaning the TM bowl, put TM basket in place & weigh in rice. Reset scales & pour 1000g hot water into TM bowl over rice. 4) Place marinated steak in the Varoma dish. 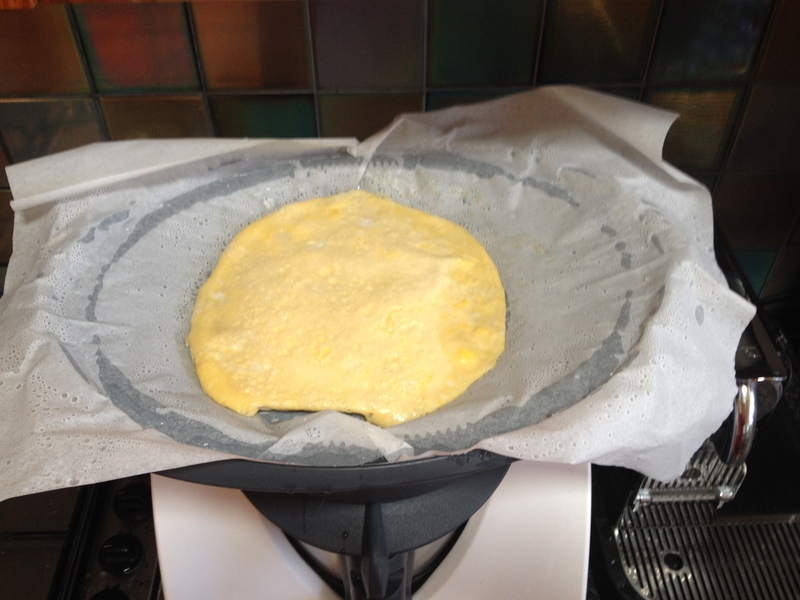 Line the Varoma tray with a damp piece of baking paper & pour wished eggs onto paper. 5) Cook the rice, steak & omelette for 20 minutes/Varoma temperature/speed 3. 6) Pour cooked rice into a ThermoServer along with the omelette to keep hot. Wrap the cooked steak in foil & rest. 7) In a clean, dry TM bowl, add oil & cook 2 minutes/Varoma temperature/speed 1. Add ginger & chilli, chop 4 seconds/speed 7. Scrape down the sides of the bowl. 8) Add vegetables, cook 6 minutes/Varoma temperature/reverse/speed 1. 9) To serve, mound the rice in a bowl. Slice the steak & omelette. Arrange the steak, vegetables & omelette on top. When cooking the steak in the Varoma dish, ensure there are holes in the base of the dish that are uncovered, so the steam can travel through the Varoma dish & tray. 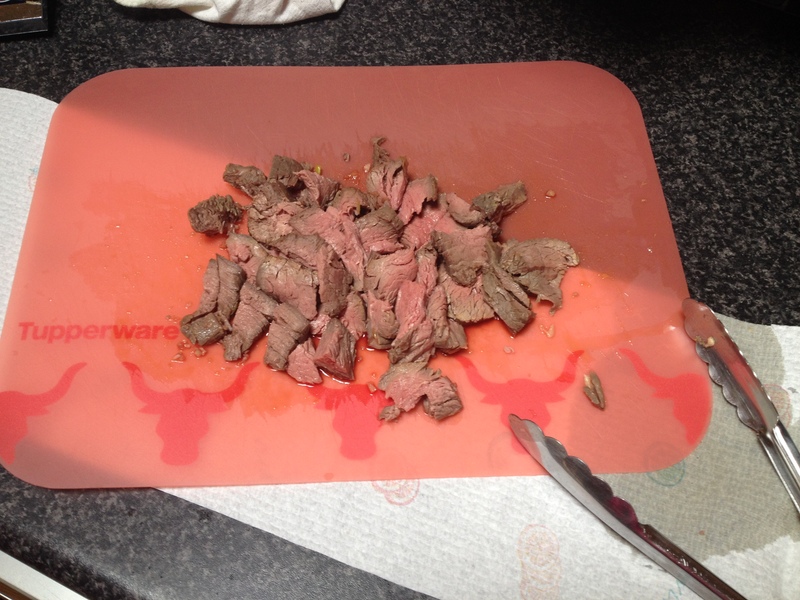 I have made this dish before, by slicing the steak before it’s cooked. The result was still very good, but I highly recommend cooking the steak in one piece. 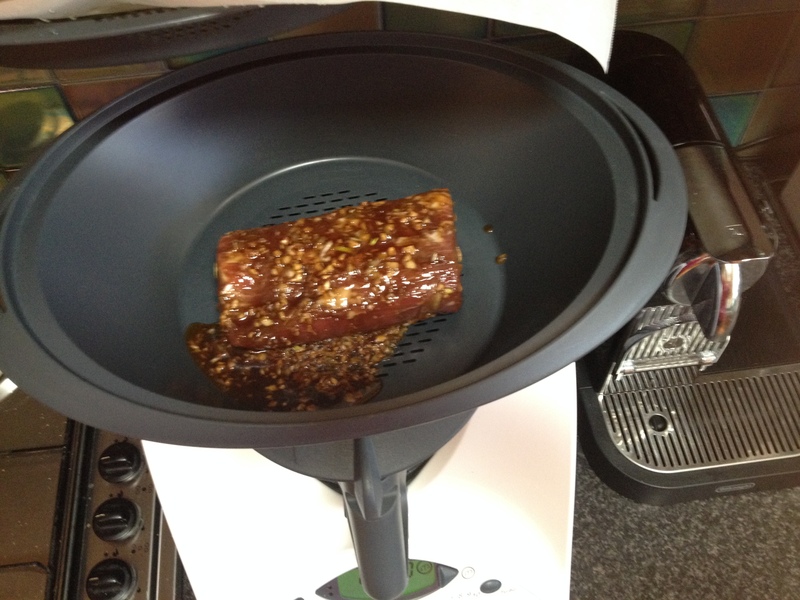 Here’s a few photo’s if your sceptical about steaming meat. This steak is perfectly cooked!